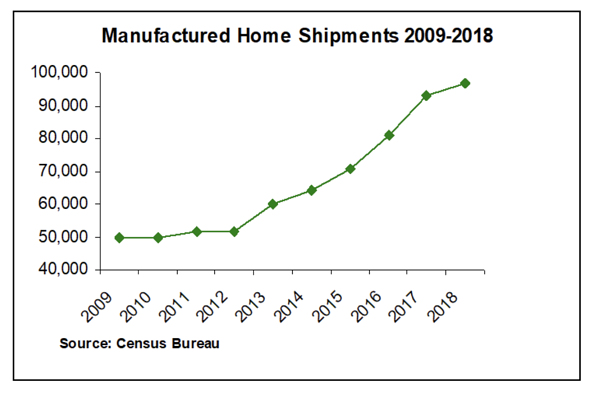 With shipments that have increased steadily since 2009, the manufactured housing market is on the rise, as shown in the adjoining chart. Furthermore, manufactured housing advocates together, with government agencies, are actively supporting a series of affordable housing initiatives, which are expected to speed up that growth. The most recent regulatory changes in conjunction with the ongoing efforts that are being made to alleviate regulatory burdens and develop a new manufactured housing finance reform for both conventional mortgage products and chattel-secured loans will have a positive impact on the entire manufactured housing industry, including the lending sector. That being said, the decision to implement an indirect manufactured home lending program may soon prove to be one of the best strategies for optimizing the structure of your loan portfolio. 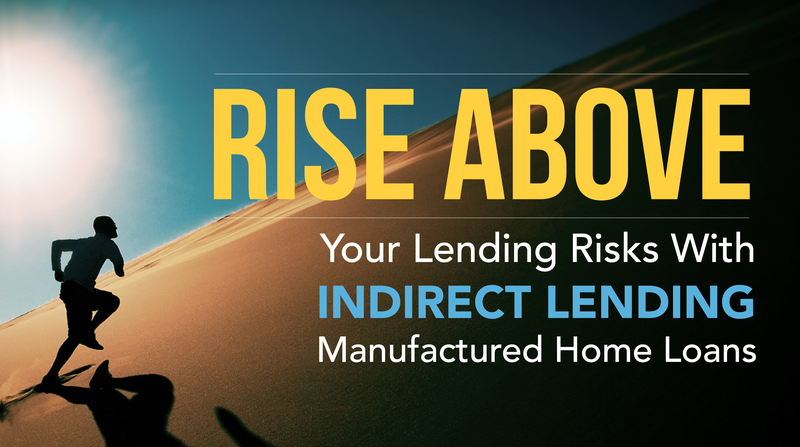 Here is how the right indirect manufactured home lending program could help you reduce loan portfolio risks and boost overall performance. In 2018, the average sales price of a new manufactured home without land was 70,600, which was $307,300 below the average sales price of a new home, according to Census Bureau. But from a borrower’s perspective, qualifying for a smaller home loan can be just as challenging as getting a $500,000 mortgage. That is mainly because many lenders don’t fund smaller loans. Although the costs associated with originating a loan increase more than revenue as the loan amount decreases, smaller loans for manufactured housing can be as profitable as any other type of loan, if the right indirect lending program is implemented according to the credit risk strategy of each financial institution. To begin with, manufactured home lending remains one of the least explored markets that can provide lucrative opportunities for many financial institutions. Based on recent data from the Urban Institute, approximately 1 in 4 homes sold for $70,000 or less were bought with a loan in 2015. In contrast, about 80% of the homes valued between $70,000 and $150,000 were bought with the help of a mortgage, according to the same source. The large proportion of homes sold for less than $70,000 without a mortgage reveals the difficulty of getting a smaller loan to purchase a manufactured home. The scarcity of small home loans also extends to manufactured home refinancing. Another point worth mentioning is that the manufactured housing finance sector has been increasing regulations over the years, so it currently provides better consumer financial protection. As a result, a higher number of people feel encouraged to finance the purchase of a manufactured home with a chattel loan. But for that, manufactured home loans should be more readily available from a higher number of sources. By considering all these factors, a financial institution that implements the right indirect manufactured home lending program will have an opportunity to explore a new finance market by extending secured, affordably priced manufactured home loans to a wide pool of prospective borrowers. When done correctly, higher loan origination volumes will inevitably translate into more revenue and profit. When it comes to expanding into a new lending market, borrower profile is a concern. To gain insights about the potential borrowers who might qualify for manufactured home loans, it’s essential to look at demographic characteristics. More precisely, the people who are currently renting indicate the potential borrowers who could move from renting to owning a manufactured home. In 2017, the typical renter income was $38,900. This means that a renter with income of $38,000 could afford a $100,000 manufactured home, with zero down payment (when land is used as collateral in our LandPlus program) if he or she uses 24% of his or her income to pay for a 30-year fixed-rate manufactured home loan, at a 5.5% interest rate. This suggests that many renters can actually afford to purchase a manufactured home. Because Triad Financial Services, performs advanced calculations based on past evidence of repayment records, income level, DTI ratio, and employment history, our borrower default risk is virtually non-existent. This is one of the many reasons that financial institutions choose to partner with us. Pilot government programs like the Duty to Serve rule and new initiatives, such as the MHI’s recommendations on tax deductions and GSE reform, together with indirect lending programs from specialized manufactured home lenders will build momentum for a secondary market for manufactured home loans. All the programs and actions that are actively supporting the manufactured home financing sector will expand the secondary market for safer, scalable, market-priced and secured manufactured home lending. This, in turn, will allow more financial institutions to enter new partnerships and explore new models for generating liquidity. Providing valid alternatives to traditional mortgage products, indirect manufactured home lending programs from lenders specializing in this industry sector could better serve the creditworthy, yet underserved borrowers looking to enter homeownership. For more information about our indirect manufactured home lending program, please contact our experienced specialists today!